Entries must be submitted by December 21, 2018 at 10:00 am CST. Winners will be contacted by direct message on Facebook by December 24, 2018. Prizes. Three (3) winners will be selected at random from comments left on the giveaway posts on Facebook.com/Cavenders. 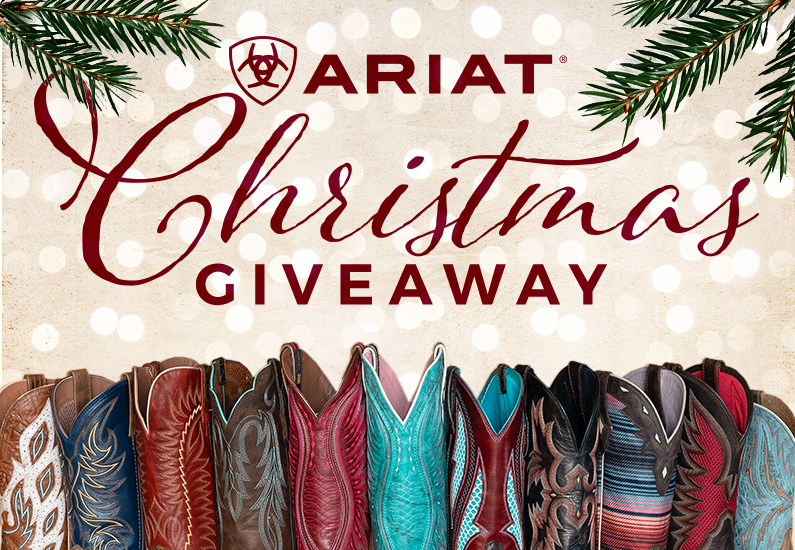 Winner will receive a prize of two (2) Ariat men’s and/or women’s Ariat boots each valued up to two hundred seventy dollars ($270.00). Entering. This Sweepstakes begins online December 3, 2018 and will end on December 21, 2018 at 10:00 am Central Time. To enter, visit Facebook.com/Cavender and leave a comment answering the question asked under the given sweepstakes photo. No photocopied or mechanically reproduced, including facsimile, mail-in entries will be accepted. All entries received are the sole property of Cavender’s. Winner’s Selection, Notification and Acceptance. The winner will be selected at random. The odds of winning will depend on the total number of entries received by the end of the entry period. The winners will be contacted by direct message on Facebook and must respond to the notification within 7 days in order to claim the prize. In the event an entrant does not respond within 7 days after notification, a new winner will be selected at random. The prize will be mailed to the winner at our expense promptly after the response to the notification is received. The prize is not assignable, transferable, or redeemable for cash, and no substitutions by the winner will be allowed. The winner is solely responsible for all expenses, costs or fees associated with acceptance and use of the prize, and is solely responsible for reporting the receipt of the prize to all applicable taxing authorities and payment of any taxes due as the result of such receipt. If the prize is not claimed by an eligible winner in accordance with these Official Rules, it will not be awarded and will remain the property of Cavender’s. Upon fulfilling the prize, Cavender’s will be deemed to have awarded the prize to the winner, and the winner assumes full responsibility for the prize. Cavender’s reserves the right, in its sole and absolute discretion, to (i) choose one or more alternate winners, and (ii) disqualify any entrant that it believes violated or potentially violates any of the Sweepstakes requirements set forth herein or otherwise fails to comply with any provision of these Official Rules. Spending time with the family is the best gift from God.. Thanks for a chance to win a new pair of boots. Happy Holidays!! Christmas reminds me of the love God has for us. In turn we show our love for Him, family, friends, and others around us. God bless and Merry Christmas to all. I love the compassion and warmth the holidays bring. Family and my wife spending time with them enjoying our best days and times with eachother. I have always wanted a pair of your boots !! My fingers are crossed !! My favorite thing about Christmas is my family together celebrating Jesus,…the reason for the season first and foremost, the fun of Santa with our little Sweets, memories of our past Christmases and the dreams of our future Christmases to come. So thankful and blessed to have all my children and grandchildren and the rest of our loved ones here to celebrate with me and my Husband!! !